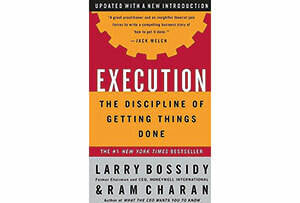 Straight talk and robust action are the watchwords in the business classic Execution by Larry Bossidy and Ram Charan. Straight talk and robust action - the caricature of American business methods - endure. And if you want a distillation of the hard-headed route to success, this book from over a decade ago does the job well. The authors were, respectively, a leading CEO (Bossidy) and a strategy guru (Charan). And, perhaps in a response to the failures of the first dot.com boom ('Web 1.0'), there is a back-to-basics feel about the text. If you want to 'execute' well there is no room for fluffiness. ‘You need robust dialogue to surface the realities of business,’ Bossidy and Charan write, ‘the kind that can leave people feeling bruised if they take it personally.’ Straight talk is ‘live ammo’, they say. This book popularised the notion that, while ideas are all very well, it is how you put them into practice that counts. Hence the emphasis on execution above all else. Get past the self-serving tales of success in this book and that lesson still holds good.